This section focuses on the economic (monetary) costs associated with not wearing a helmet. The monetary costs associated with motorcycle crashes are the tangible losses resulting from the crash and the value of resources that are used to restore crash victims to their pre-crash physical and financial status. These monetary costs include: payments for hospitals and physician care, emergency medical transport, rehabilitation, prescriptions, allied health services, medical devices, nursing home care, insurance claims processing, coroner and premature burial costs for fatalities, future earnings (including wages, fringe benefits, and housework lost by the injured), public services (including initial police response and follow-up investigation, as well as emergency transport and fire services) and property damage and loss. 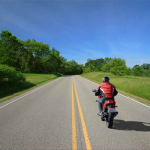 Motorcycle crashes also result in nonmonetary quality-of-life costs. These are costs associated with pain, suffering, and other intangible losses resulting from injury and fear. Comprehensive costs are the monetary costs plus the estimated costs associated with nonmonetary quality-of-life costs. Studies consistently find that in the event of a crash, helmet use reduces the fatality rate, the probability and severity of head injuries, the length of hospital stay, the necessity for special medical treatments, the probability of long-term disability and the costs associated with medical treatment. The literature has widely explored acute medical costs, but research is sparse in the areas of long-term medical and work-loss costs. For victims of serious head injury, acute hospital care might be only the first stage of a long and costly treatment program. For many crash victims, lost wages from missed work days will outweigh medical costs. And for victims who are permanently disabled, their earnings might be reduced for the rest of their lives. How then, in the face of this evidence do we not have an all-rider helmet law in every state? The author of an on-line article (https://www.sciencebasedmedicine.org/the-cost-of-repealing-mandatory-motorcycle-helmet-laws/) in Science Based Medicine explores the medical costs of repealing a helmet law within the context of real-world politics. The author points out that unless the research evidence is denied, advocates for repeal must simply make the argument that they believe their freedom not to wear a helmet is worth the cost in human lives, disability, and money and then let the chips fall where they may. This is a Traffic Safety Facts Research Note released in May 2018 based on crash data from 2016. In 2016 the use of motorcycle helmets saved an estimated 1,859 lives – if all riders had worn helmets and additional 802 lives could have been saved. Nearly $3.4 billion in economic costs and $21 billion in comprehensive costs were saved by the use of helmets but an additional $1.5 billion in economic costs and $9.2 billion in comprehensive costs could have been saved if all riders had worn helmets. A March 2018 report completed by Lidia P. Kostyniuk, Ph.D, P.E., Research Scientist, Emerita with the University of Michigan Transportation Research Institute calculating the reduction in monetary costs and deaths that would have been prevented in Michigan in 2015 if all riders involved in crashes would have worn a helmet. The National Highway Traffic Safety Administration annually (this is the 2016 edition, 2014 data) provides information on the number of lives saved by the use of DOT-compliant motorcycle helmets, as well as the potential number of lives that could have been saved at 100-percent helmet use. The report states nearly $3 billion in economic costs and more than $18 billion in comprehensive costs were saved in 2014 by the use of motorcycle helmets. If all motorcyclists had worn helmets in 2014, an additional $1 billion in economic costs and $7 billion in comprehensive costs could have been saved. This study sought to quantify, on a statewide level, the healthcare burden of unhelmeted motorcycle and moped riders. Protective associations with helmet use are stronger among motorcyclists than moped riders, suggesting the protective effect is augmented in higher speed crashes. The public financial burden is higher from unhelmeted riders who sustain more severe injuries and are less likely to be insured. Motorcycle crashes are a major public health concern which place economic stress on the U.S. healthcare system. Injured, non-helmeted motorcyclists require substantially more healthcare resources than helmeted motorcyclists: the differential healthcare costs between non-helmeted and helmeted motorcyclist injuries account for an additional $290 million. Helmet use on motorcycles fits squarely within the purview of the federal government public health and economic considerations. An abstract of a literature review the purpose of which was to clarify the economic impact of motorcycle helmet use. The review only included articles that were primary studies, written in English, evaluations of periods after 1994, and published in a peer-reviewed journal. Meta-analysis demonstrated that nonhelmeted patients required $12,239 more in hospital costs per patient. Nonhelmeted patients also required more postdischarge care and were more likely to use publicly funded insurance. Abstract. A cost analysis of inpatient care and indirect costs of motorcycle riders who do not wear helmets leads to nearly $2.2 billion in losses per year, with almost 1.9 times as many deaths compared with helmeted motorcyclists. The per capita cost per fatality is more than $800,000. Institution of a mandatory helmet law could lead to an annual cost savings of almost $2.2 billion. Abstract. The study presents a financial model to estimate how the lack of a mandatory helmet law impacts the cost of health care in the state of Connecticut. This model demonstrates that the lack of a mandatory helmet law increases overall health care costs to the state of Connecticut. The purpose of this article is to estimate the impact of the state law in terms of hospital admissions for traumatic brain injury (TBI) and associated hospital charges. Averted hospital charges to taxpayer-funded sources were estimated to be between $9.5 million and $11.6 million for 2011, and total averted hospital charges for 2011 were estimated to be between $25.3 million and $31.0 million. This is the 2015 NHTSA annual report (2013 data). The lives saved resulted in an estimated $2.8 billion saved in economic costs, and $17.3 billion in comprehensive costs by helmet-wearing motorcyclists. An additional $1.1 billion could have been saved in economic costs, and $7.2 billion in comprehensive costs, if all motorcyclists had worn helmets. Presentation by a Ph.D. student in Public Policy (Economics) University of North Carolina at Charlotte. This study shows the economic advantage of wearing a motorcycle helmet. The expected monetary savings increase as the severity of injury increases. Based on analyses conducted by the University of Michigan Transportation Research Institute (UMTRI) using actual 2009 motorcycle crash and cost data for the state the projected costs if the helmet law had been repealed in 2009: (1) An increase in total monetary costs from $351 million to $497.1 million (2) An increase in total non-monetary quality of life costs from $425.8 million to $655 million. This is a publication by the U.S. Department of Health and Human Services, Centers for Disease Control and Prevention National Center for Injury Prevention and Control. This is an excellent resource for distribution or use in presentations. Contains a table of economic costs saved by helmet use per registered motorcycle by state, 2010. In 2010, economic costs saved from helmet use by society in states with a universal helmet law were, on average, $725 per registered motorcycle, nearly four times greater than in states without such a law ($198). Abstract. This retrospective study was designed to delineate the health care and insurance costs of adult trauma patients admitted to a Level 1 trauma center due to a motorcycle crash (MCC). The results demonstrate that medical costs due to an MCC for an unhelmeted motorcyclist were significantly higher than for a helmeted motorcyclist. This is the 2011 NHTSA annual report (2008 data). Abstract. A review offered as an educational resource to encourage and facilitate health care worker participation in legislative efforts to support implementation and maintenance of universal motorcycle helmet laws because of the finding that universal helmet laws lower the health care costs and associated societal burdens of these crash victims. A well referenced review including Section VI - Non-helmeted Riders and the Costs to Society, beginning on page 21. Abstract. This paper reviews economic evaluations of motorcycle helmet interventions in preventing injuries. A comprehensive literature review focusing on the effectiveness of motorcycle helmet use, and on mandatory helmet laws and their enforcement was done. Abstract. The differential healthcare economic burden between unhelmeted and helmeted motorcyclists is approximately $250,231,734 per year and underscores the need for improved legislation to improve motorcycle helmet utilization. Abstract. Helmet use was associated with lower injury severity, mortality, and resource utilization. Non-helmeted motorcyclists accrued greater hospital charges and were significantly less likely to have health insurance. When controlling for alcohol or drug use, mortality continued to be significantly associated with non-helmet use. Abstract with web link. A review of 25 studies, selected from over 200 identified that examined the impact of safety helmets or helmet laws on motorcycle injuries and also studies that examined the question of who pays for medical costs. The studies (all identified in a chart) consistently found that helmet use reduced the fatality rate and the costs associated with medical treatment. Also, some studies showed only slightly more than half of motorcycle crash victims have private health insurance coverage. For patients without private insurance, a majority of medical costs are paid by the government. General Accounting Office report to Congress on the results of an evaluation of existing studies on motorcycle helmet laws and summary findings on (1) the effectiveness of helmets in preventing deaths and serious injuries, (2) the effect of helmet laws on helmet use and fatality rates, and (3) the costs that society incurs when motorcyclists who do not wear helmets are involved in accidents. GAO'S conclusions were drawn from 46 studies that contained original data or original analyses and met minimum criteria for methodological soundness. The data on the cost of motorcycle accidents indicate that nonhelmeted riders were more extensive users of medical services and long-term care, and were more likely to lose earning capacity through disability.